Geographic atrophy (GA) is the advanced form of dry age-related macular degeneration and is a leading cause of blindness in the Unites States. Currently, there is no FDA approved therapy for the over 1 million Americans with GA. One major goal of the laboratory was to identify novel molecular targets to fight this major unmet health need. We recently identified a class of RNA molecules - Alu RNA transcripts - cause RPE degeneration, which is a critical step in the pathogenesis of GA (Kaneko et al., Nature 2011). We further identified a new protective role for the enzyme Dicer1 whereby it cleaves Alu RNA transcripts, rendering them innocuous. 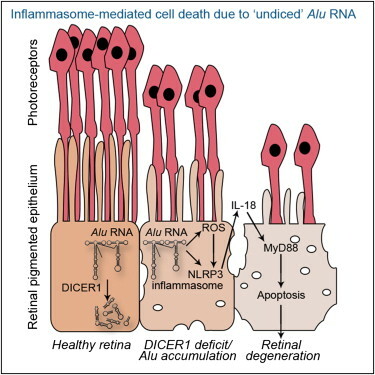 In GA, the abundance of Dicer1 is reduced which leads to accumulation of cytotoxic Alu RNAs and RPE degeneration. This work was highlighted by commentaries in Cell (2011) and Nature (2011), and will serve as the foundation for the rational design of therapeutics for treating this pervasive disease. The main goal of the laboratory is to elucidate molecular mechanisms that fundamentally regulate vascular growth in normal and diseased states in the eye. In 2006, we answered the foremost outstanding question in vascular biology: "What is responsible for avascularity of the cornea?" This work (Ambati et al., Nature 2006) demonstrated that, contrary to prevailing dogma that a multitude of anti-angiogenic molecules was required for corneal avascularity, a single protein - soluble VEGF receptor-1 - was uniquely responsible. This work was hailed by Science as a “Signaling Breakthrough of the Year” (Adler et al., Science STKE 2007), and is far-reaching because the cornea is the default platform for testing therapies for cancer, atherosclerosis, and other diseases driven by angiogenesis. In 2009 this work was extended to the lymphatic vasculature with our discovery and characterization of a similar, soluble, splice variant of VEGF receptor-2 (Albuquerque et al., Nature Med 2009) which sequesters VEGF-C and is responsible, specifically, for the alymphatic cornea. Alu RNA induces priming of NLRP3 and IL18 mRNAs via generation of ROS. Activation of the NLRP3 inflammasome triggers cleavage of pro-IL18 by activated Caspase-1 to mature IL18. 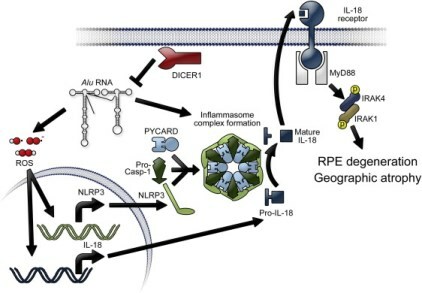 IL18 signals via MyD88 to phosphorylate IRAK1 and IRAK4, which leads to RPE cell death. Several corneal and retinal diseases are hallmarked by neovascularization that often leads to irreversible blindness. We seek to identify the specific mediators for such pathologic responses in order to develop targeted therapeutics to reverse and prevent these devastating disorders. Our laboratory was the first to demonstrate the presence of in situ complement activation in the retina and choroid of patients with age-related macular degeneration (AMD). We showed (Nozaki et al., PNAS 2006) that this complement activation triggers the angiogenic switch that transforms the disease state from an atrophic to a neovascular phenotype. This vital observation has now resulted in the initiation of pre-clinical/Phase I clinical trials of complement inhibitors in AMD by more than a dozen pharmaceutical/biotech companies. Crucial to this translational advance was our lab’s report of the first animal model of AMD (Ambati et al., Nature Med 2003). This data in conjunction with several other studies has supported a major paradigm shift towards inflammatory and immunologic mediators playing a significant role in the development of AMD and its progression to choroidal neovascularization.